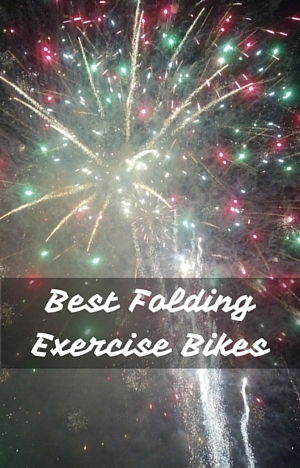 The top 5 best folding exercise bikes are all a great way to get more exercise in your life without spending a fortune on the gym or on a piece of home exercise equipment. And from the comfort of your home. They’re compact and can be folded up out of the way when not using them – so your living space is still yours. It makes them ideal for all homes – from small apartments to large homes. In selecting the bikes for this best of list I’ve looked at the comfort, sturdiness, durability , ease of movement and folding up, have a console for monitoring performance (more for tracking then to relied on totally) and able to be adjusted to fit a range of users. In terms of price these are all affordable for most budgets especially when compared to the cost a month gym membership. The bikes selected here can help you find the bike that will help you choose the folding exercise bike that is right for you. This is one of the most popular upright bikes with price being a consideration but it does offer more than just that. Despite it looking lightweight it holds user steady and has stood the test of time for those looking for moderate levels of exercise. It can fit people from between 5 ft 3 ins and 6 ft 1 ins and has a maximum user weight of 300 lbs. Only the seat is adjustable – up and down – it’s quick and easy to do. Although the seat is padded many (not all) do find it hard on their sit bones but it can be sorted with a get seat cover. Aside from this it’s a bike that can be used any time of the day or night for improving and maintaining fitness. With this folding exercise bike you actually use it in a semi-recumbent position which is half way between upright and recumbent. The seat has a backrest which you can lean back against for support and comfort. It comes with a good reputation for comfort. It can be quickly adjusted for people between the heights of 5 ft 2 ins and 6 ft 2 ins. It is easy to get on and off with its low step through and seat for all heights. It holds you steady while you exercise with no rocking or wobbling. It’s quick to fold up and has rollers that help in moving the bike to and from storage. The handlebars are at the side of the seat which have pulse sensors to monitor your heart rate. It is possible to use the bike with an adjustable table to rest a laptop or tablet on. The third Exerpeutic bike in the list fits the largest range of customers. It can accommodate people between the heights of 5ft 1 ins and 6 ft 5 ins and people weighing up to 400 lbs. As with most of these bikes it doesn’t come with much in the way of accessories, In this case it comes with a holder for a remote controller or phone. It has amonitor for measuring calories, time, speed, distance and when the heart pulse sensors are gripped you can also see your heart rate. It can be a little difficult to get on to because of the x-frame design and some people find a small step can help in getting their leg over. It folds up quickly and has transport wheel to help when moving it. This is a no frill bike except for a console. It helps to keep the price at one of the lowest for an exercise bike. The console monitors speed, distance, time and calories burned. It does keep steady as you exercise and has on the whole proved durable with people get good use of the bike. It can be adjusted to fit people between the heights of 5ft 2 ins and 6 ft 3 ins and support people up to 250 lbs. It has 8 levels of resistance (as do all bikes here) that can be easily adjusted using the tension knob – going from easy to moderate difficulty. It moves between the levels smoothly. Folding up is quick and simple. However, it doesn’t come with transport wheels to help with moving. The bike weighs 39 lbs. Customers find they get a smooth and quiet ride. The bike holds them steady allowing them to get on with their exercise when and where they want. Read the full review here. The big advantage with this bike is that it comes with a desktop so you can exercise while you work rather than having to make time to do it outside of work time. It is quiet enough that it could be used in a work office too, without disturbing others. It is straightforward to fold up and has transport wheels that make it easy to move around. It can be adjusted to fit people of various sizes between 4 ft 10 and 6 ft 4 ins and up to a maximum weight of 300 lbs. The seat can be adjusted up and down and the desk can be moved horizontally to get the best and most comfortable position for each person. Customers comment that this is the one piece of exercise equipment that they actually use. All these bikes are quiet(all suitable for apartments), come with basic consoles and can be used by a range of users. They’re best for people who are beginners and/or those looking for people who want light to moderate exercise – they’re not really designed for those looking for tough and more challenging workouts. Because they are quiet you can exercise while you do something else like watch TV or listen to music, speak on the phone or work using a laptop (as with FitDesk or a semi-recumbent model). These top 5 foldable exercise bikes are a great affordable solution for low impact cardio exercise that can be used at any time and not disturb other in the house or your neighbors.